Police cordon off the scene of Saturday night's acid attack in Hong Kong. 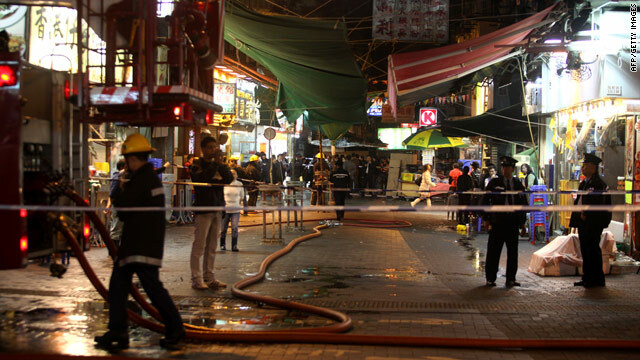 Hong Kong, China (CNN) -- Police in Hong Kong said they have arrested one man in connection with an acid attack that injured 30 people at a popular tourist haunt Saturday night. Police said the attacker hurled two bottles of acid on shoppers on Temple Street, a busy outdoor market that is a favorite of tourists and locals. The victims included children, police said. The man who was arrested was found on a rooftop with two bottle caps. Police said the caps belonged to bottles that may have been used in the attack. The man, who is in his 30s, was yet to be formally charged Sunday. Police could not say whether they suspect him in other attacks. In recent months, shoppers have been victims of acid attacks in at least four occasions. Most of them have taken place in the busy shopping district of Mong Kok, which is close to the scene of Saturday's incident. Most attacks involved someone tossing a bottle of corrosive acid from a rooftop and targeting shoppers.